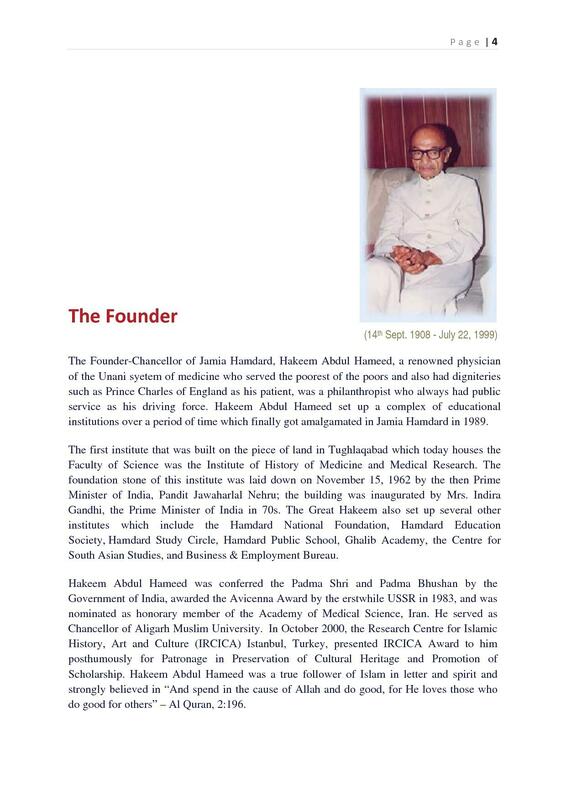 Jamia Hamdard University (JHU) is a Deemed to be University recommended by the University Grants Commission (UGC) under Section 3 of UGC act 1956, located in Hamdard Nagar, New Delhi, established in 1989; awarded an 'A' grade deemed university status by the NAAC of India. The University was set up with the formation of a small clinic (Unani) in 1906. Gradually, by doing the continuous good works in the field of medicines; the university has scaled new heights and a benchmark in the Indian Medicinal Universities. Entrance Exam or interview conducted for M.Tech aspiring individuals. Entrance Exam conducted followed by the interview for the selection of PhD candidates. A valid score in NET conducted by the CSIR/ UGC/ ICMR will be exempted from appearing in the written test for PhD candidates. Candidates interested in UG courses such as MBBS, B.Sc., BUMS, B.Pharm etc. should possess a valid score in NEET for the corresponding year. For MBA, a valid score of CMAT or other national tests such as MAT/ GMAT/ XAT/ GPAT/ ATMA etc. is necessary. For M.Pharm, a good scorecard of GPAT is necessary. For integrated BA-LLB, one must possess a valid score in CLAT. 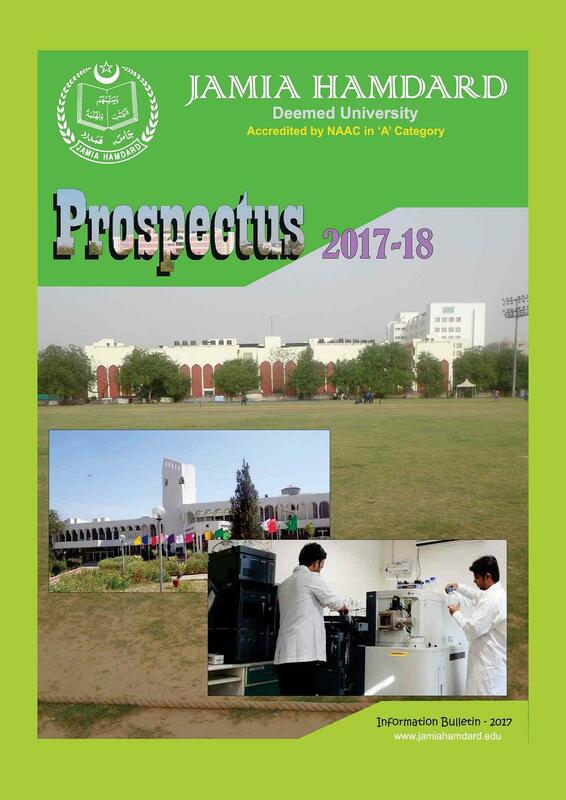 Jamia Hamdard University Admissions 2019, the University provides UG, PG and Doctoral level programs such as B.Tech (Computer Science & Engineering, Electronics & Communications Engineering and Bioinformatics, Food Technology), MBBS, B.Pharm, BUMS, MBA, PhD, (Management, Health Management), BA-LLB etc. Jamai Hamdard University B.Tech in various specializations such as CSE, ECE. 10+2 examination with Mathematics and Physics compulsory, and one subject out of the following: Computer Science, Chemistry, Electronics from CBSE or any other Board securing atleast 50% marks or equivalent CGPA in aggregate. Jamia Hamdard University M.Tech in various specializations such as CSE, Bioinformatics. B.Tech. or equivalent degree in CS / CSE/ CE/ IT/ Software Engineering / ICT with atleast 60% marks (or equivalent CGPA) in aggregate. MCA or M.Sc. (CS), M.Sc. (IT), M.Sc. (Software Engineering), M.Sc. (Elect) with atleast 60% marks (or equivalent CGPA) in aggregate. B.Tech. or equivalent degree in EC / EE with atleast 60% marks (or equivalent CGPA) in aggregate. Appeared in the Entrance Test or Interview conducted by Jamia Hamdard University. Pass through the University Entrance Test for the desirable stream followed by the interview. A valid score in NET conducted by the CSIR/ UGC/ ICMR will be exempted from appearing in the written test. Jamia Hamdard University offers MBA in Health & Hospital Management, Pharmaceutical Management, Insurance etc. and PhD in Management, Health Management courses. Jamia Hamdard University offers some Pharmacy courses as B.Pharm, D.Pharm and PG (M.Pharm) in various disciplines. Students passing out from Jamia Hamdard University do not have to wait for employment. The Training & Placement Cell helps each student in exploring placement opportunities by inviting various companies for campus recruitment of students who are in the final year of the programme and are likely to graduate at the end of the academic year. There is a benchmark already set of the university which helps each student to acquire a job before the end of the programme. For more info related to it, click Jamia Hamdard University Placements. A better place to set your future come and enjoy the journey to success. REMARKS -The college is very good. You'll have a good time here. But it is totally on you what you will be doing after 4 yrs. The college is very good. You'll have a good time here. But it is totally on you what you will be doing after 4 yrs. Eligibility criteria for MBA in pharmaceutical management. Is CAT or MAT is Mandatory for admission in MBA in pharmaceutical management? Hi Pragya, kindly go through the Admission Procedure of the university from here. Hi Pari, kindly check the Admission Details of this university to get the relevant information. Hi Zoya, You may please check this link for getting B Pharma Course detail of JHU new Delhi. Is it possible for student with PCM ,to get admission in B phrama? Hi Kriti, The basic eligibility is 10 2 with Physics, Chemistry and Biology with at least 50% marks in aggregate, and selection score in NEET UG. Non-NEET candidates can also apply. They will be selected on the basis of marks in qualifying examination and Interview. Hi Saifi, To get admission in any college you first need to clear your previous exams. If I had done 10 from ICSE board and I have marksheet of Urdu from U.P board ... Is there is any problem regarding admission in BUMS.. ELIGIBILITY CRITERIA:- A candidate must have passed Senior Secondary (12th Standard/Intermediate) examination with Physics, Chemistry and Biology from Central Board of Secondary Education or any other examination recognized by Jamia Hamdard as equivalent thereto securing at least 50% marks in the aggregate as in Physics, Chemistry and Biology. ADMISSION GUIDELINES:- Admission based on NEET. I want to know regarding MBBS branch..plz let me know about it ASAP.. Candidates must have passed the subjects of Physics, Chemistry, Biology and English individually and must have obtained a minimum of 50% marks taken together in Physics, Chemistry and Biology at the qualifying examination. for more information regarding the admission process, please click here: Admission 2018. 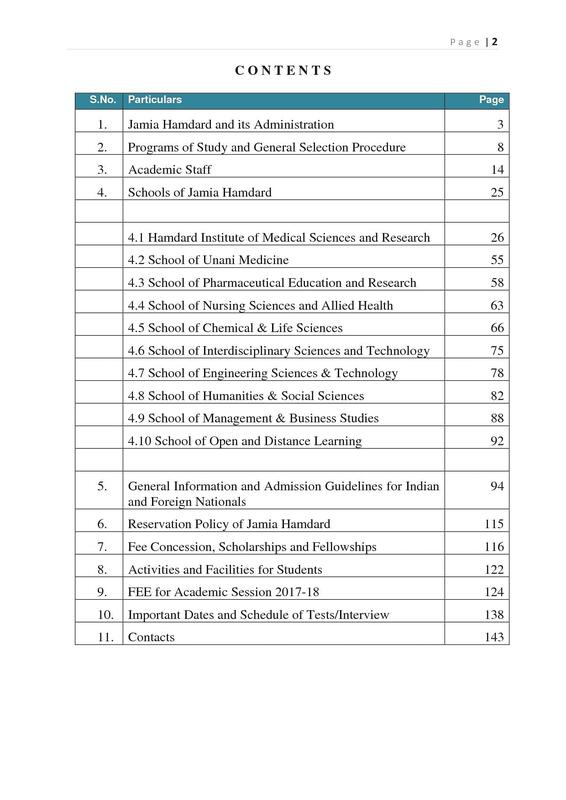 Does jamia hamdard offers pharm.D...??? If yes, then what is the procedure??? 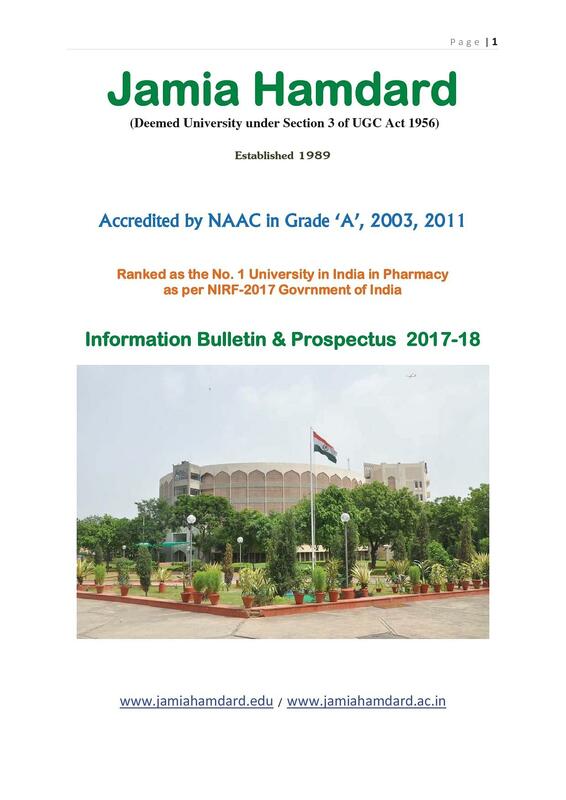 Hi Annu, yes, this university offers Pharm D and for the same, you must have master’s degree in relevant discipline from the recognised university. For more information, please contact on 011-26059688. Hi Rafia, This college does not provide the Pg Diploma in Account and Finance stream. Hi Asma, This university does not provide any lateral course in CSE stream. GPAT was cracked by getting 118 marks and I took admission their to give a hike to my career and to have a lot of opportunities regarding my professional life. "One of the nicest University i have ever seen." "I would say that not a awesome environment but found great friends."